Maybe a kind admin will sticky this some day? Rubber squeegees. In a pinch, you can cut a pair from a coffee can lid - that soft plastic is about the right strength. Round the corners so they don't drag. It needs a smooth edge. Wide popscicle mixing sticks. eBay, $4. 2" wide Disposable "chip" brushes. Harbor Freight, $12. Mixing cups. Make sure they have NO wax - those sold for "hot" applications are fine. I like the wider, shallower ones and usually get the 36-pack of 12oz soup cups from Costco for like $9. Hair dryer. Do NOT try to use your wife's! Walmart, $10. Nitrile gloves. Harbor Freight, $9. 3mil plastic sheet, on a roll with no crease. $20 online, but one roll will last you forever. Dremel or (better) Black & Decker rotary tool. You ought to own this anyway. A few dozen sanding drums and the little raspy cutter thing - the one they sell for drywall. 12-pack of bi-metal hacksaw blades. No hacksaw required, just the blades. $9 at Home Depot. Cheaper at Harbor Freight but I think they mean a different pair of metals because they don't last nearly as long! 100-pack straight edge razor blades. Harbor Freight, $4. Sounds like a lot, but tool-wise most of you readers probably have a lot of this lying around. Fiberglass fabbers are famous for re-using all kinds of things in a pinch. When the epoxy is just about to set up on you, you'll grab anything to spread it if you can't find your squeegee. Try to avoid grabbing your credit card! [LIST=1][*]Epoxy kit. I did some online searching and found that buying your first run separately probably doesn't make sense. Get the "West System Epoxy Kit" from a place like Jamestown Distributors. This is a gallon kit that may last the life of your project or more if you aren't making a lot of stuff. It includes the resin, hardener, pre-measured pumps, mixing sticks, squeegees, etc. You can knock off some of the tools above if you get this. $150. [*]BID cloth. Cloth is sold in weights. My preference is 8oz because I'm used to it, but you can do 6-10. 6oz is $55 for 10yds x 3' wide right now - if you watch eBay and poke around sometimes you can find it cheaper. When you measure, remember that you usually need two layers so double your estimates. [*]UNI cloth. Totally optional. Costs about the same. [*]Microballoons, 1lb. $10. [*]Cotton flock, 1lb. $4. [*]Foam substrate if necessary. Prices vary by type. BID is called that because it stands for "Bi-Directional". It has 50% of its fibers along the X-axis, and the other 50% along the Y-axis. So its strengths run that way, too. BID is the most flexible option and is usually easy to get to go around curves when necessary (you lay the cloth at 45-degrees to the curve). UNI is uni-directional (mostly). 90% one direction (the long axis), 10% the other. There are also oddballs like tri-ax, carbon fiber, etc. If you know enough to choose cloths you probably aren't reading this so stick with BID. There are lots of options here. The most common for making sheet-type goods (skins, frames for cabinets, etc.) is H45 PVC, sometimes called "Divinycell". 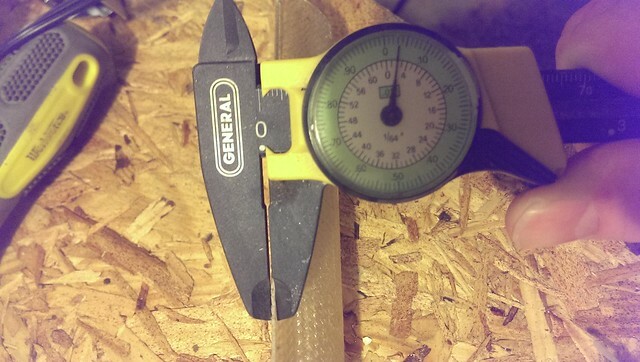 3/8" is a common thickness. This cuts easily with a razor blade, shapes mostly-easily with 24-grit sandpaper (or very easily with a router/power rools), etc. The second option is styrofoam - usually not the white kind you're used to in cups, but a blue variant that's denser and more rigid. If you're a scrapper, look for boat docks. They're commonly used as floatation blocks in these and you can often find them for free. The outside will be nasty, but trim it off and the inside will be perfectly fine. Styrofoam is hard to shape with sandpaper but very easy to cut with a "hot wire" so it's often used to make things like wing shapes in airplanes where you stick templates on the sides and run a hot wire across them. The third most common option is urethane, either from (not as common) pour foam or (more commonly) bought in blocks. Urethane is light super-weak sandstone. You can shape it with a fingernail, or very light passes of 150-grit. It shapes like butter, so it's perfect for making weird things like duct tubes around a heater core. It's very hard to get epoxy to stick to it, though, so usually you cover it with duct tape then pop it off the form once it's cured. This couldn't be simpler. It's good practice to start here, and you can use the pieces you made as material for things like electrical switch panels or tank access hatch covers. Lay out sheet plastic on a flat workbench - make sure it's clean because any imperfections will imprint onto the layup! Cut and lay out a layer of cloth the size you want to make the sheet. (Put down one of cloth at a time.) If you need multiple pieces for a big sheet, overlap their edges 1"-2". Mix a cup of epoxy VERY well. Don't mix more quantity than you need - it'll "kick off" (set up) too soon and you'll waste it. You should see NO swirls or patterns once mixed - if you can tell the resin and hardener apart in any way, keep mixing (if you think it's mixed in 10 seconds - keep mixing). Scrape the sides of the cup as you do this so it's thorough. Using a chip brush, apply small quantities to "wet out" the cloth. Once you do this the first time you will immediately know what I mean by "wetting out". The fiberglass will go transparent. Use the brush to "stipple" (tap vertically) the surface to work the epoxy around and get out any air bubbles you can see. Make sure the cloth is fully wet out. If you have more layers of cloth to add do it now while the first is still wet. Lay the cloth out and repeat the steps above. If the epoxy starts to get stiff and hard to work, hit it with the hair dryer. It's beautiful - it will flow like water. I ALWAYS use a hair dryer whether I need it or not. Apply a final layer of plastic to the top and use the squeegee GENTLY from the center out to work out any air bubbles. You don't need this 100% perfect... but try for it. Once cured, remove plastic and cut to shape. Most layups require 2 layers of cloth. 4 layers will make it extra strong and I do this for things like switch panels or stuff that will take abuse. The Cozy MKIV landing gear "hard points" are 25 layers, and will take sledgehammer blows without breaking. It sounds like a lot of steps but it goes quickly. With practice, you can make a 1'x2' switch panel or hatch cover in about 20 minutes. Provide shape. Foam is easily shaped with sandpaper, carving tools, knives, etc. When people say they like fiberglass vs. metalworking, they usually mean they like shaping the FOAM. Provide rigidity. Not strength, but flex resistance. Using the same principle as honeycomb adds to cardboard, you can take two thin sheets of fiberglass that bend and flex a lot, put foam between them, and have a super-rigid panel that you can barely bend with a vice. Provide "crush resistance". Fiberglass is very strong in tension (pushing on a sheet, trying to bend a sheet, etc) but an unsupported sheet can still sag/crush. Foam spreads this load so it doesn't dent. When you want the foam to stay put you need to fill its pores or it soaks up epoxy and makes a poor adhesion between the two. This can cause the fiberglass skin to "delaminate". This is bad. The fix is simple, though. Make "micro" first by adding microballoons to a cup of epoxy until it's very thick, like lukewarm honey. Spread this on the foam and force it into the pores with a squeegee, then squeegee off any excess on the surface (you're only filling the pores, not applying a layer to the surface). This micro slurry provides excellent grip from the fiberglass to the foam without adding much weight. Cut the foam to size, then shape as desired with sandpaper, cutting tools, power tools - whatever seems appropriate. Prepare the surface of the foam as described above with duct tape or micro. Do the layup exactly as described above for "sheets" but with no plastic underneath, only on top. The cloth goes right on the foam, obviously. Let it hang over the edges a bit. You can attach two fiberglass components together by using... more fiberglass! Following the same rule as big sheets above, you need a 1-2" (2" is standard) overlap. The only difference here is that since that's all you need, you typically do it with a 4" wide strip (called "tape" but it's just a strip of cloth that wide, nothing special). Also, since the pieces have usually cured by now, you have to prep them first. You do this by sanding both sides for the width you'll be taping, usually fairly aggressively (although not all the way through). If the pieces to be joined are perpendicular (or any other angle than on the same plane) and parallel) you also need to make a fillet between them because fiberglass doesn't bend at perfect right-angles. 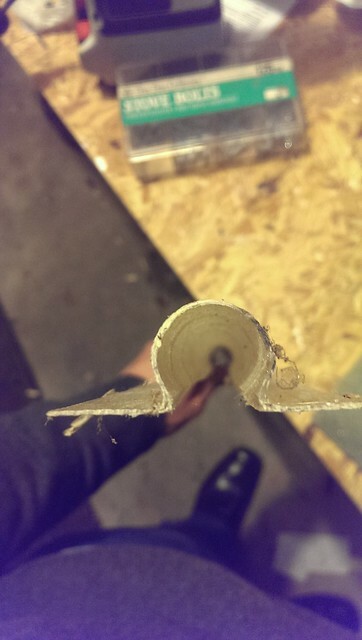 You need about a 1/4"-1/2" radius to fill the corner of the joint. This is usually done with a slurry of flox, rather than micro, because flox produces a structural joint. It's made exactly the same way, just use the flox rather than the micro when mixing. Prep sand both surfaces to be mated. Sand down until you see fiber, but preferably not through it. If you sand too far, no biggie! Just sand (more carefully) a wider width, and apply a thicker/wider BID tape. Fiberglass is super easy to repair. Wet out the surfaces being taped with a thin layer of epoxy. 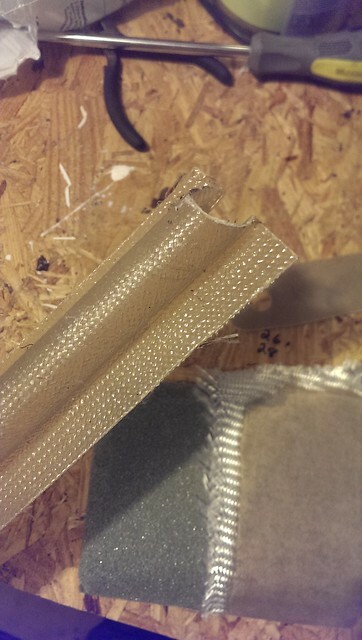 Apply the first layer of BID tape to that area and press gently to get the epoxy to hold it there. Do the rest of the layup as described earlier - epoxy the first layer, stipple, apply more cloth, repeating as many times as necessary (usually 2 is enough). Plastic over the top and squeegee to get a clean finish. Do the plastic-cloth-epoxy-plastic dance as described earlier to make a 2-layer BID tape a little wider (5") than required. Don't wait for it to cure. While still wet, use scissors to trim it to width. You can get a super nice cut edge at this stage. Wet the surfaces being taped with epoxy just like above. 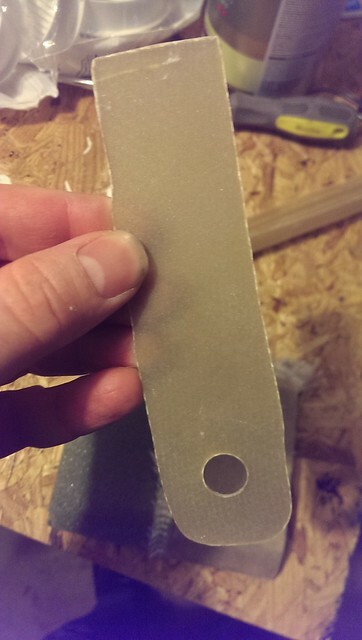 Peel the back layer of plastic off the tape you made and press it into place. Squeegee to work out the air bubbles. Taping is a 30-minute job once you're experienced at it. I will post pics and hopefully videos later, but hopefully the above gave anybody who might have been thinking about doing this a starting point. A few photos to get the ball rolling. 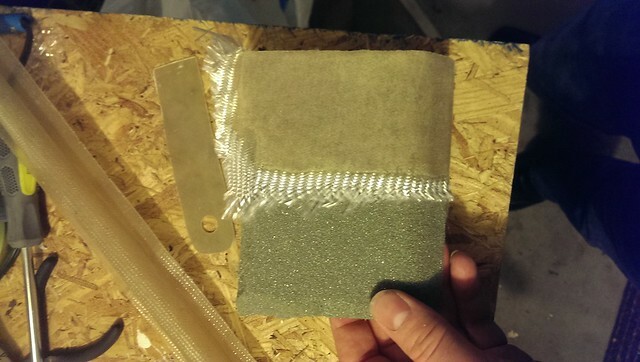 This first one is a demo layup I made for a friend, just a few square inches of cloth on foam. It was done exactly as described above - squeegee micro into the foam pores to fill them, then add two layers of cloth and epoxy. The surface here is very smooth because I did something else, totally optional but it makes beautiful output: I used something called "peel ply". This is just a synthetic fabric, usually something like a polyester or nylon from the craft store or you can spend $ on the same stuff from a fiberglass materials shop. The epoxy soaks through this but doesn't stick to it. When you peel it off layer, it shears off the surface to make a perfectly flat, textured surface. You can use a high-build primer and paint this right away, or do another layup on it without sanding. Side view of the same layup. This is very thick foam, 1". 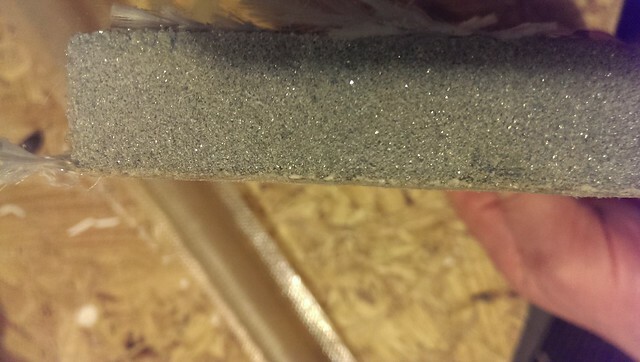 This foam is used in the seat back and other structural sections of the Cozy MKIV aircraft. At this thickness it's currently $77 for a 3'x4' sheet. Most projects use much thinner foam. The thinnest, 1/8", is great for things like body panels and instrument clusters, and is only $17 for the same size sheet. You don't need to use exactly this foam. But for structural work this one makes a very strong product. Note the shaped profile here. This is also common, and should make it obvious how easily you can make shapes and profiles. You just shape the foam to whatever form you want the finished product to take and then do the layup over it. In this case it was just a 45-degree angle with a radiused edge, but you can do all sorts of things. This second set shows an electrical channel I made for covering wires. I made two pieces but only needed one so I saved this for some future project. I installed the first one with pop rivets through the flanges you see. I also have a length that I cut one flange off of. Fiberglass is very springy when it's thin, so I was able to make a section where I can stuff the wires in the side and they stay put, but I can get them back out by bending the loop open and pulling the wires out. I made this by wrapping a piece of EMT electrical conduit in duct tape, clamping that on my workbench on top of a sheet of plastic, and doing a layup on top, two plies of BID. I made it a bit oversized and cut/trimmed the flanges to get the neat cut line you see here. That's standard practice with fiberglass - leave some overhang and trim. Here you can clearly see the surface weave. I didn't use peel ply or plastic on the top of this. It wasn't going to be a visible/finished surface so there was no need to do that. In this edge view you can see some delamination in the inside corners. No big deal - this isn't structural. It's because I just stuffed the fiberglass around the conduit by hand. BID can bend around a corner, but it doesn't hold a tight radius very well. If I actually cared about this, I could have put aluminum foil on top. 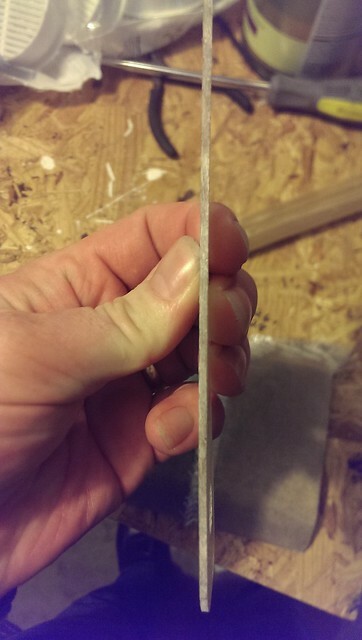 Epoxy won't stick to that, either, like plastic - and foil holds it to a shape when you need that. This is a mounting tab I made for a storage bin I wanted to "pivot" on a 1/2" dowel. The bin was going to hold some weight so I made it with four plies of BID. But otherwise it's the simplest of the bunch. It's just four plies laid up on a sheet of plastic on my work table, then cut and drilled to the shape you see. It took all of 5 minutes to lay up, and another 5 to cut/drill. Note how I didn't bother with a perfectly straight line - this wasn't going to be visible so I just did it by hand. 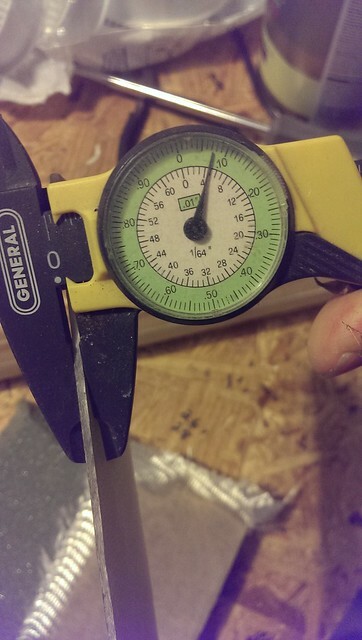 To prove that out I grabbed my analog calipers. I really love my digital ones but the battery keeps dying and I can't be bothered to keep replacing its odd button cell. So I almost always end up using these. It's perfectly accurate, despite costing all of a few bucks. Same story here - the calipers are placed correctly, I just couldn't hold it all to get a good shot. I did OK. This isn't EXACTLY twice the other one (two plies was .035" and four was .075") but .005" is really good tolerance for this kind of work.